When the next U.S. president takes office, he or she will have a new perk -- an official Twitter account ready to go with millions of followers. That's because the account launched Monday by President Barack Obama, @POTUS, or President of the United States, will stay with the office. "The handle comes with the house," Obama tweeted in reply to a question from former President Bill Clinton, who said he was "asking for a friend" in reference to his wife Hillary, a 2016 presidential hopeful. The Tweeter-in-Chief, as one hashtag put it, inaugurated the account with a joking tweet: "Hello, Twitter! It's Barack. Really! Six years in, they're finally giving me my own account." While Obama has had a Twitter presence before -- his campaign account @BarackObama has nearly 60 million followers -- @POTUS is the official Twitter account for the U.S. president. White House staffers and Twitter did not immediately reply to a request for more information on why the account was only being set up now for the president. The account will feature "tweets coming exclusively from him," a staffer wrote in a White House blog post. "@POTUS will give Americans a new venue to engage on the issues that matter most to them." A photo accompanying the post showed Obama tweeting with a smartphone from the Oval Office. Jen Psaki, White House director of communications, said in a tweet , "to dispel any confusion that is not his iPhone." Obama is known to use a super-secure BlackBerry phone. 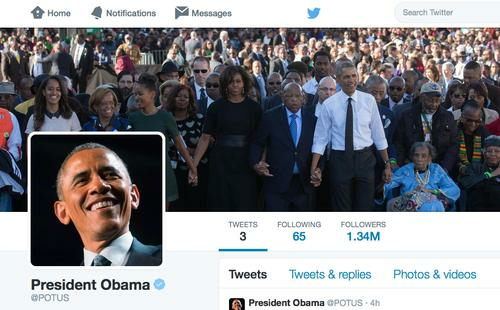 Obama tweeted only three times on the account's first day, but he quickly amassed nearly 1.5 million followers. Many remarked on the similarity of @POTUS to @FLOTUS, an account run by the Office of the First Lady, Michelle Obama, who is still slightly ahead of her husband at 1.9 million followers. And who does the U.S. president follow? So far, 65 other accounts, mostly U.S. government agencies and officials, but also a few universities and sports teams in Chicago. A fan of the Chicago White Sox, Obama chose not to follow the Chicago Cubs.